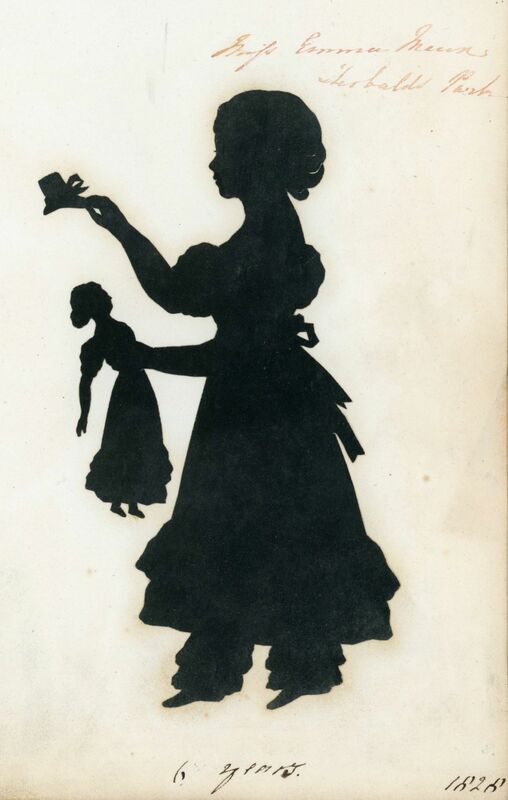 When itinerant silhouettist Augustin Edouart decided to retire after twenty-four years touring the British Isles and then the United States, he packed up his archive containing duplicates of all the profiles he had ever cut and booked a passage on the Oneida that was carrying cotton across the Atlantic. But a few days before Christmas 1849, the ship was wrecked off the coast of Guernsey and, although Edouart and his fellow passengers were all saved, much of the cargo and luggage was lost. Only one of Edouart’s many cases was salvaged so all that remained of his precious and unique archive were about fourteen volumes. We can only guess how many there were originally but there were surely one hundred plus volumes. 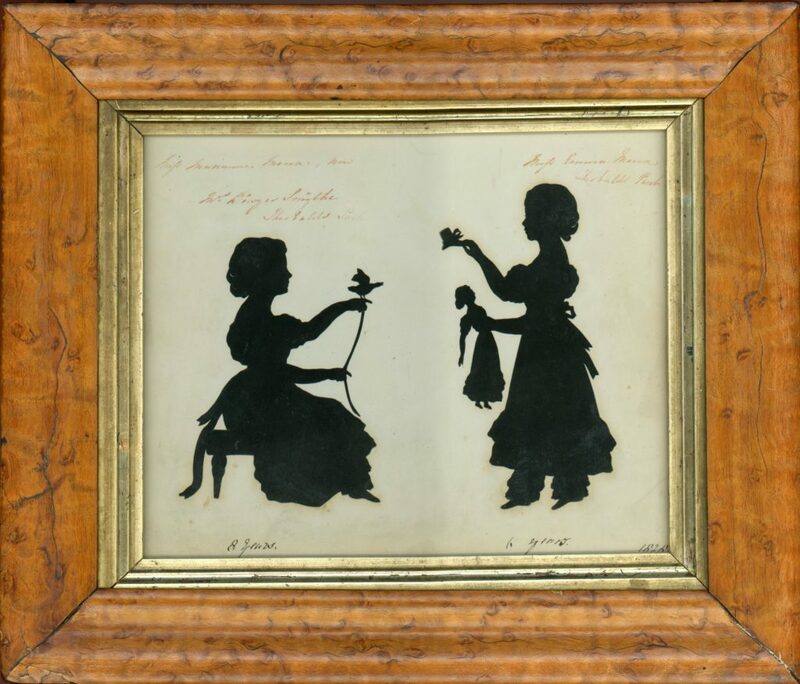 This delightful silhouette of two children was cut in 1828 just a couple of years into Edouart’s career as a silhouette artist. 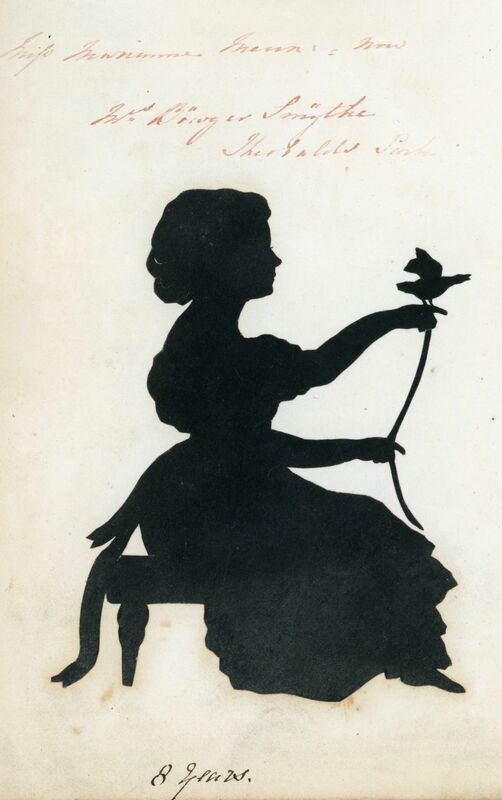 It shows eight-year-old Marianne Meux seated on a footstool with a tiny tethered bird perched on her finger. Facing her is her little sister, six-year-old Emma Meux, with her favourite doll. Living at Theobalds Park in Hertfordshire, the girls were the daughters of Sir Henry Meux, 1st Baronet and Elizabeth Mary Smith. Eleven years later in 1839, Marianne Frances married Sir William Bowyer-Smith, a cricketer and politician. She died in 1875. Emma Martha remained single until 1853 when she married Lt.-Col. Arthur de Vere Capell, Viscount Malden. She died in 1905 at the age of eighty-three. 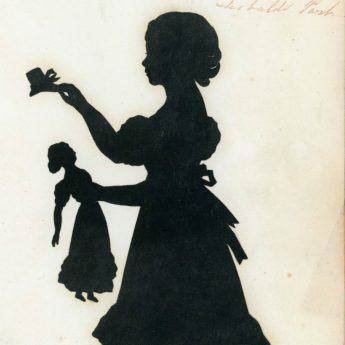 The silhouette is dated 1828 and inscribed with the girls’ ages along the bottom. It is additionally inscribed with their names at the top and was updated with Marianne’s married name. This was typical of Edouart who frequently re-visited his volumes to add snippets of information. 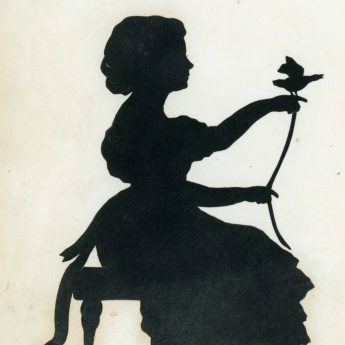 The silhouette has some brown spotting perhaps caused by the gum. It is housed in a handsome bird’s eye maple frame with a gilt slip.